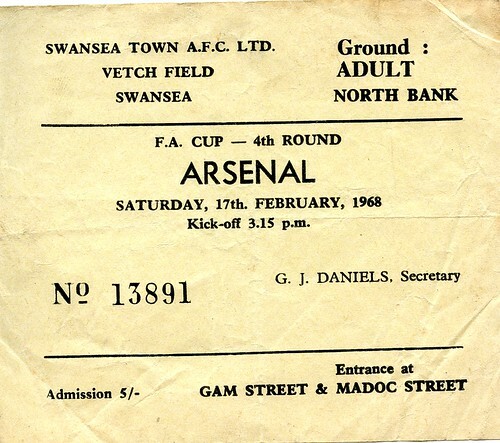 The record attendance for a match at the Vetch was against Arsenal for the FA Cup 4th round in 1968. 32,786 people somehow squeezed themselves into the Vetch, only to see the lads go down by the only goal of the match, scored by Bobby Gould. Fans remember being squeezed into the ground ‘like sardines’. To put the crowd size into perspective, only a month later, under 4,000 watched the home draw with Lincoln City. Arsenal were rather lucky to win, as this report in the Daily Express noted. The match was also one of the first to see serious crowd trouble at the Vetch. You can download the whole match programme here.